With two hot Cars movies and another one on the way, this theme is definitely a favorite with little boys. Recently my grandson turned two. When it came time to plan the party, there was no question what the theme would be, Disney Cars. With all the Cars themed party supplies we found and other fun ideas we came up with ourselves, preparing for the party was a breeze. The party was a huge success. The kids had a blast. It was definitely one of our best ever. We have mapped out the route. So rev up your engine and get ready for a smooth ride, destination one great party with McQueen, Tow-Mater and the rest of the gang. Now that you have chosen to do a Disney Cars birthday theme party, it's time to decide a few things like where the party will be held, what date and time it will be on and who will be on the guest list. Don't worry, we're here to get your wheels turning and keep you on track. Where to have the party is an important decision so take into consideration the weather, size of your house and number of guests expected to attend. For my Grandson's Disney Car birthday party, we opted for the park even though it was mid-September and in Colorado, anything could happen. The park had a Community Center that was available to rent so we reserved it “just in case”. Turns out the weather could not have been better but we were totally prepared to take it inside had that not been the case. You may want to have the party at your house. Little ones are often more relaxed at home and you can also decorate ahead of time. Make sure your house will accommodate all the guests. If you have a nice backyard, you may want to have the party outside but if you do, make plans to move it inside if rains, snows, gets too hot or too cold. Amusement facilities are another option as are kid friendly food places like McDonald's and Chuck E. Cheese. Skating, bowling and miniature golf places are fun too and entertainment is provided. 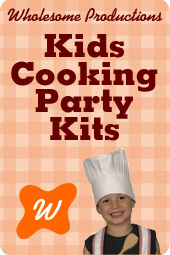 Often you can purchase a party pack that may include food, cake and partyware. Make your reservations early and double check them as the party date nears. Time to choose the invitations. You can make your own using our homemade Disney Cars birthday invitation instructions or purchase them. Here are our favorites. Make sure the place you have decided upon is clear on the invitation. Include the street address and a map if possible. If you are having it at a park, be very sure to include the name of the park. Once you have settled on a date and time, make sure to include not only the date but the day on the invitation. It's always a good idea to add “R.S.V.P.” at the bottom of the invitation so you can get a good idea of how many guests will actually attend. Remember though, there will always be those who don't R.S.V.P. But will show up. Print the invitations neatly then it's always fun to sprinkle some confetti inside. Let your birthday boy or girl decorate the envelopes with stickers after you have addressed them. Mail the invitations several weeks in advance. Congratulations, you have completed the first lap on the map! Time to take a brake for cake, the tastiest pit stop of all. Children look forward to seeing and eating the cake so don't let them down. With our collection of tried and true Disney Cars birthday cake ideas and recipes, your cake will certainly be a winner. My Grandson recently turned two and was visiting his other grandparents in New York on his birthday so he had two parties. In fact, he is such a “Lightning McQueen” fan, he actually had two Disney Cars parties and the first Cars cake that his Grandma made was such a hit, his parents made him one just like it for his party at home. Make our basic yellow cake mix or your own favorite or store bought one then pour into a well greased and floured Disney Car Lightning McQueen cake shaped pan according to the directions. When the cake has baked and cooled, carefully flip the cake over onto a foil lined sturdy cardboard, board or cookie sheet. You can use some excess table cover or a piece of gift wrapping paper for liner instead of the foil if you would rather. Tint decorator's icing with the appropriate colors. The pan should come with instructions or you can look at our picture to determine the colors. I prefer to use Wilton cake coloring when making bold colored icing. Place icing in decorator's tubes and alternate tips to give the desired effects or according to the cake pan directions. This cake will disappear in no time so be sure to take pictures. If you are low on time or just prefer the easier route, a Disney Cars topper is a great idea and very easy to make. Mix a cake with our basic cake recipe, your own favorite or a store bought mix. Bake according to directions then frost when cooled. Place a topper on the cake like this one from Birthday Express. You can top with actual Disney cars like Lightning McQueen and TowMater if you would rather. If you are feeling imaginative, create your own race track to set the cars on. Of course you can order a cake from a local bakery or boutique but be sure to arrange ahead of time if so. Just before time to serve, top the cake of your choice with a Disney Pixar Cars candle. Cupcakes are fun to make and easy to eat. They can be made quick and simple with frosting and sprinkles, or with toy toppers (my favorite) or you can get really creative and make candy designs on them like our candy car cupcakes. Here are some great ideas and recipes. For Mom's on the go with little time to spare, these cupcakes are fun and easy. Bake cupcakes in using our basic yellow cake recipe, your favorite recipe or a store bought mix. Of course you can use chocolate or another flavor instead. Pour into Disney Cars cupcake liners. Bake according to directions then cool. Frost using our frosting recipe or your own and top with Disney Cars sprinkles or Disney Cars sugar shapes. Another great option is to follow the instructions above but place a Disney Cars cupcake topper toy like these.For our party, we used the car toys and the children absolutely loved them because of course they got to take the car toy home for a party favor. Serve the cupcakes on sturdy piece of cardboard or even a cookie sheet. You can line the cardboard or cookie sheet with foil or what I like to do is to line with a piece of excess table cover (they always seem to be too big for the table anyway). You can also cover with coordinating wrapping paper, just tape it on the backside. Another option is a cupcake rack like this one. A portable cupcake carrier is a must for parties away from home and even makes a safe place to store them if it is at the house. Boys and girls....start your engines! It's time to rev it up and play some fun Disney Cars party games. We have beat the streets to find the best games so here are our personal favorites. For your convenience, we have divided them into three sections: games for older children, games for younger children and games appropriate for both. Let the children race these fun balloon cars. Set up a starting and finish line. Wave a checkered flag to signal the start. 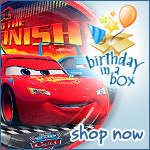 These cars can be purchased through Birthday in a Box and make great take home gifts as well. This is a fun outside game that encourages children to work together. You will need cups filled with water (like small Styrofoam ones) for each child and two empty plastic milk jugs. Divide the group into two teams. It's always fun to let them pick a name for their team. The two teams will race against each other down “Route 66” which is a designated area straight line. The twist is that they will have to stop midway to “fill up with gas”. To do this, they will grab a small cup of water and run it to the awaiting container at the finish line. Once they have poured the water into the container, spilling as little as possible, the next team member can take off. When the last racer on each team has finished the containers are measured and the one with the most water in it wins. This is a fun and easy game for youngster that we played at our party. It is the Cars Party version of “Duck Duck Goose”. Have the children sit in a circle, facing each other. One child is “it” and walks around the circle tapping each child on the head as they go, saying “Mater, Mater...” then taps one on the head and says “McQueen”. Whoever is “McQueen” gets up and chases the child who is “it” around the circle. “It” tries to sit in “McQueen's” spot before “McQueen” can tag him or her. If “it” gets tagged, he or she sits in the center of the circle until another “it” gets tagged. If he succeeds, he sits in “McQueen's” spot. Lightning McQueen is missing a tire. Have the children help get him back on the road with this fun homemade game. Trace or draw a McQueen car (minus one tire) onto a posterboard. Your birthday child can help color or paint it before the party. Cut out tires from black construction paper or poster board for the children to take turns trying to tack on while blind folded. You will need one tire per player and can use two sided sticky tape to make them stick. The child who comes the closest to the spot the tire should go wins. This game is a must for a Disney Cars party and can be played by older children too but is especially fun for the little ones. Make a start line and finish line. I used electrical tape for both. One child is “it” and he shuts his eyes and counts to ten while standing on the start line. He or she then calls “green light”. The children race from the start line toward the finish line. When “it” calls “red light”, all the players must stop immediately. If anyone is caught moving they are out. “It” can also call out other colors to throw the players off. The first one to reach the finish line wins. Have the children take turns throwing a bean bag or stuffed toy (a plush Disney Car is what we used). We used electrical tape to mark the spot for the children to stand. Each child gets three tries and the scores can be added up but we didn't keep track, we just made it fun to try. Set up an obstacle course race track by using whatever you have around the house like pillows to climb over, chairs to crawl under, toy cars to go around, and large boxes to go through. We found some orange cones to set around and decorated some boxes to look like gas pumps. We also used a play tunnel we had already. We used black electrical tape to mark the finish line. Line the children up. Wave a checkered flag to signal when it is time for the first child to start his or her turn. You can purchase a flag (click on the picture for more details) or make your own by using our easy instructions. The object of this game is to get to the finish line as quickly as possible without knocking over or moving any of the obstacles. *This game can be made more difficult for older children or simplified for younger ones. For older ones, you can divide the group into two teams and actually time them to determine the winning team. It's time for the hungry children to fill their tanks at Flo's “filling station”. We have worked tirelessly to bring you lots of great tried and true snack and food ideas and recipes so you can relax and just follow in our tracks. If your party falls around mealtime, you will want to provide some filling food like mini checkered flag sandwiches. Our party was at the park in the afternoon so we went all out and had a tailgate party complete with hot dogs, mini hamburgers with all the fixings and race day chicken nuggets. We made Lightning McQueen sandwiches using car cookie cutters to cut out the shapes. Check out our Fillmore Fillings for tasty spread ideas. Mater Taters went over great at our party. We made it in a pyrex casserole dish and when it cooled, topped it with a toy Tow-Mater car. Fruit trays are always good and nutritious too. Slice a watermelon, some cantaloupe and honeydew on a platter or plate. Add apple slices too if you wish. Arrange whole strawberries and grapes. Veggie trays are always a hit. Place celery and carrot sticks, broccoli spears, cherry tomatoes, cucumber slices and olives. Add cubes of cheese and serve with ranch dip. Both veggie and fruit can be served in true race day spirit on a checkerboard plate. You can do like we did and make your own plate using this tape if you prefer. Disney Cars Color-a-Cookie is a tasty snack that doubles as a fun craft for the little ones. It comes with a cookie and food coloring pens and is available online. This Race Car Cookie Kit gives you everything you need to make fun car cookies. Disney Cars has become so popular, we found it easy to find lots of fun snacks in the theme like raisins and graham crackers cookies. You can even get Disney Car themed graham crackers. We picked up a box and served them in a black and white checkered dish. Prebaked and decorated Cars cookies are available through Amazon. They even offer organic ones. Another idea is to set out chocolate “mini” donut “tires”. Make sure to have plenty of plates and plastic utensils available and don't forget the napkins! Use an equal amount of dark brown and white bread. I used six of each. Spread sandwich filling on a white slice and top with a dark slice. Repeat, alternating dark and light slices but do not put filling on the outside of the last piece. Trim crust and wrap and refrigerate until firm. When the bread is firm, slice in ¼ inch slices. Cut those slices into flag shapes. Arrange on a platter and serve while still slightly chilled. I made a checkered flag for our party using an old white pillow case. I simply cut it in the shape of a flag and ironed hemming tape on the edges. I made the black squares with this great black and white checkered tape onto the pillow case. Then I hot glued the flag onto a small wooden dowel. We used the flag as a table decoration and later to signal “go” when playing games. How about makingCars - The Movie Pillowcase Kit for 8. Birthday in a Box has some cool kits for this. My son did this at a party and it was a hit.